Everything You Should Know about Data Security and Encryption ! Home» Tips & Tricks » Everything You Should Know about Data Security and Encryption ! We’ve entered a time when the conveniences of widespread connectivity, including the cloud, have put us at more risk than ever of getting hacked. When data does fall into the wrong hands, the consequences can be devastating. High-profile data breaches and ransomware attacks have organizations and individuals on red alert for the best ways to safeguard their data and networks, both now and for the future. If you’ve been putting off adopting encryption as a part of your security policy, delay no more. Here’s a guide to the science of encryption, and how you can begin implementing an encryption strategy today. Encryption is a process that works in a way to protect your private data from the prying eyes. 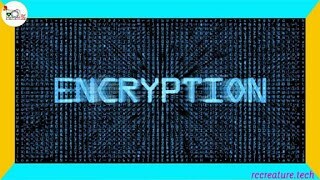 Today, encryption is known to most of the users (tech-savvy) as compared to a few years earlier where nobody is able to grasp this terminology. Back in the days, encryption was compared with the likes of password protection, file locking tools etc. But soon with the passage of time, it was made clear that encryption stands tall against these mediocre safety options. The concept was to replace the DES with Triple DES algorithm. It was considered as an option as hackers had identified how to defeat the former one. In the industry, there was a time when Triple DES was the most preferred standard and most commonly used algorithm. This type of encryption uses 3 separate keys (56 bits each). When combined, the total length of the key ranges to 168 bits however, experts claim that 112-bits is rather feasible. Regardless of being eliminated, Triple DES still works in the sectors in the financial services and other similar industries as an encryption solution. Also Read :How to Improve Your Brand by Marketing Company Toronto ? RSA is an asymmetric algorithm unlike Triple DES as it uses a pair of keys. You use your private key to decrypt message and the public key which you use to encrypt the information. All in all, it makes it difficult for the prying eyes to proceed any further into your stuff. This type was created only to replace DES where blowfish divides the information into a total 64 bits and each one of them is encrypted separately. Blowfish stands out for its quick speed and as claimed, it has no competition in speed. But the vendors however took complete advantage of it being freely available in the public domain. You can find this type of encryption in e-commerce platforms for safe payments which is quite flexible and easy to use. Twofish is an encryption algorithm that uses up to 256 bits in total length but only one key is required as a symmetric method. Known for its speed, Twofish is used for not only software environments but also for hardware related uses. Twofish similar to Blowfish is a free tool to use due to which, it is heavily bundled in programs of encryption. Hands down on this one, no questions asked. This type of encryption uses efficiently 128-bits form, 192, 256 bits for solid encryption reasons and even more. AES stands for advanced encryption standards is by far the most reliable form of encryption algorithm that so far hasn’t seen any limitation of lacking behind. The creators have made the claim of it being unbreakable. What lies in the future of Encryption? Since there is no stopping to the prying eyes, the time is ripe for you to surround yourself with the above mentioned security options. We do consider these types of algorithms and encryption software for windows to be safe but know that it is only a matter of time these hackers find a way out of these standards. The future however holds the concept of honey encryption that would render hackers helpless by serving false/fake data for every wrong guess or attempt of entering the key code. Such type of technology is planned to slow down the prying eyes but forcefully hides the right key in a haystack. This method would surely slow them hackers but for how long, we are not sure.